Forgive the inclusion of a personal portrait. 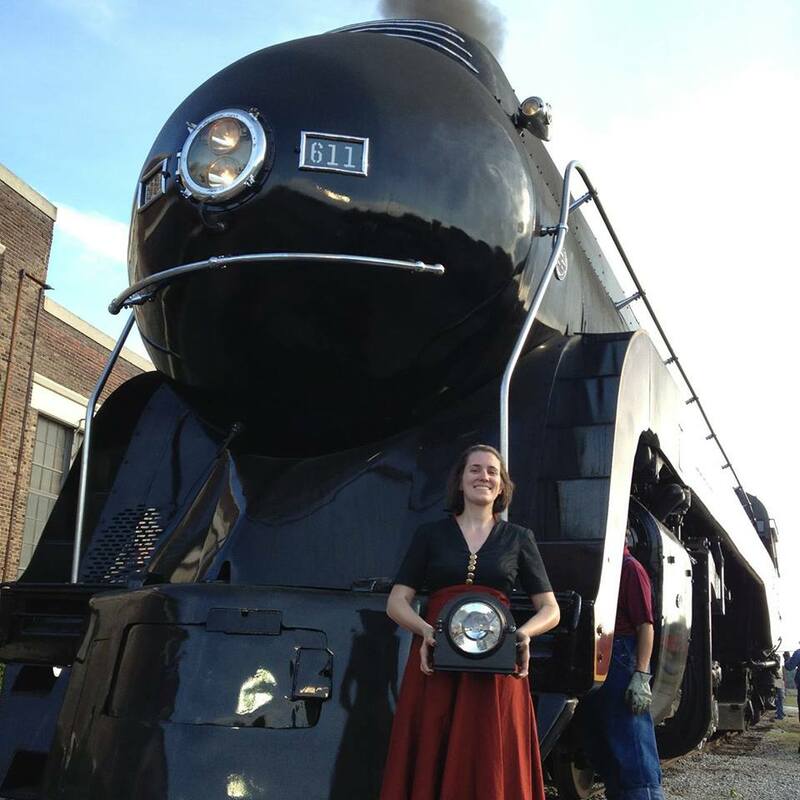 Two articles ago, Friends of the Flange discussed the nuances of preserving first-generation diesel locomotives. This article isn’t quite a sequel, but more of a tangent into the nature of preservation. So many steam locomotives and passenger coaches were culled during the 1950s and 1960s that it sometimes seems like a miracle any of them survive into the present day at all, let alone that more than a hundred of them are still in operable condition. Keeping them supplied with enough money and spare parts is an ongoing battle, though, and the railroad network as a whole has continued to evolve. This is the curator’s paradox: The most effective way to ensure public appreciation of any historic artifact is to display it in its original form, performing its intended function, but the given age and condition of that artifact, doing so may not be wise or even possible. To draw an analogy, the best way to make museum-goers appreciate a rare vinyl record would be to play it, but each time it spun it would incur a slight amount of wear that would drastically shorten the record’s life. A digital copy of the music would not convey the same warmth and intimacy as vinyl, but it would not wear down the record with each playing and would allow listeners who do not own a turntable to share the listening experience. The same sort of challenges complicate railroad preservation efforts, especially considering that today’s railroad is regulated differently than in the 1950s and has since then integrated many technologies that did not exist during the age of steam. Most of the deviations forced as a result of these challenges are too subtle to intrude on the experience of riding on a train. FRA glazing stamps and reporting marks on the coaches are small and unobtrusive, the safety value of the crews using radios and wearing safety vests is too obvious to be questioned, and the average rider would never even glimpse the way that excursions and major repairs are timed around a 1472 inspection. Deviations from historical accuracy that are more visible, and are not specifically required by the letter of the law, incur more scrutiny. Several months ago, in the weeks just leading up to the 611‘s first run, the railroad corner of the Internet was besieged by threads lamenting real and imagined deviations from the locomotive’s traditional appearance. Most of the ire fell on an ultimately-farcical picture which appeared to show ditch lights added to the the 611‘s frame, and, while it was less visually intrusive, many commentators regarded the decision to paint the words “Spirit of Roanoke” under the cab windows as equally offensive. It was understandable that the so many would rise up to defend the 611's historical purity. Modern ditch lights would stand out like metallic tumors on any steam locomotive, especially an elegantly streamlined one. Furthermore, the 611 is one of the most recently constructed steam locomotives in the United States. The diesel era arrived too quickly for it to have yielded its place at the forefront of technology to another class of steam locomotive, nor did it have a long enough career in revenue service to suffer the indignity of being sold off to other railroads at a depreciated sum. The 611 only served one master and thus we have a clear idea of what it is supposed to be, so clear that even adding few letters alluding to its totemic status in the Roanoke area was considered offensive. There are only a handful of other steam locomotives that can claim as provincial of a personal history as the 611. The ones that can, like the SP 4449 and the members of the Union Pacific heritage fleet, are also products of steam’s twilight era. The surviving locomotives that date to the 1930s or earlier, and the small but stalwart industrial engines that persevered in niche services long after the diesel age had furloughed their earth-shaking contemporaries, weathered a much more mottled record of service. They may have soldiered on through four or five or more changes in ownership, or begun life over again in a similar number of locations. Many have endured through both, and by the present day, they are much more the stepchildren of the entities whose logos they display, not their legitimate progeny. ex-MKT tracks used by the Oklahoma City Railway Museum. The philosophy of the organization operating a certain locomotive may influence which version of ‘accurate’ is ultimately respected. 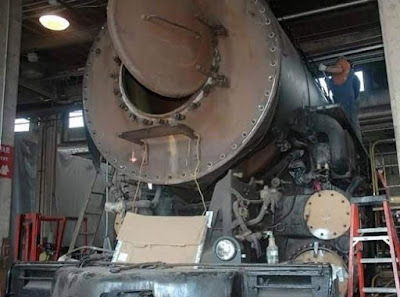 The steam locomotive owned by the organization that I work for was originally of Southern Pacific heritage, but has not born those markings for almost half a century and has been overhauled several different times since then. It has now become so iconic to the North Texas area that I suspect there would be significant pushback if it were changed to resemble its original form. In other cases--and this is far more common with preserved diesel locomotives--their owners may choose to repaint a certain locomotive in a paint scheme representative of a fallen flag railroad that once served the area. Some modifications are a concession to the fact that there is as much labor involved in operating steam as there is love, and that the sheer difficulty of keeping them fired has become exponentially more difficult now that the infrastructure that steam requires has mostly disappeared. The three engines in the Union Pacific fleet will all eventually run on oil instead of coal, and many engines undertaking long excursions carry extra tenders. These sorts of modifications may not be accurate, but they do ease the process of running the locomotives somewhat. That is ultimately the question at just below every debate about historic accuracy: Is it better to see a locomotive running, or to hold off operations unless one specific definition of 'correct’ can be obtained? How much of a deviation from one definition of “accurate” or another can we willing to tolerate before a preserved train’s allure breaks down? Can minor peccadilloes--say, a slightly inaccurate shade of paint, be forgiven if the correct color cannot be obtained in modern times? Does an allusion to the fact that the locomotive continues to make history insult its past? There is indeed a threshold where inaccuracies become too much, but hard rules cannot be drawn where a clear standard does not exist. For those readers who are are already typing up an angry protest that yes, you can find a hard definition of historical accuracy, and whether or not it is achieved is paramount to the success of an operation, I will say this: It is worth remembering that those of us who uphold such an unwavering definition of historical accuracy from a place of love. Hours upon hours dedicated to researching a certain piece of equipment or recreating it in miniature makes us indignant that caretakers of the full-sized version appear to lack the same scrutiny. In my opinion--and very likely also in the opinion of those members of the public who don’t actively participate in or donate to preserved railroading, but might be inspired to do so if the inspiration to do so rolls up in front of them--strict historical accuracy is more of a garnish on a public excursion than it is the meat of the experience. The visceral draw of a seeing a locomotive in steam does in action or pretending that riding in a vintage coach takes us into a simpler time does not diminish depending on what icon is painted on the equipment. A whistle does not sound less alluring if it the locomotive that it is attached to wears a few more electrical apparatuses than it did in its heyday. For my part, you could paint a locomotive polka-dotted and I would still be glad to see it run. I don't hold on to one version so tightly that I'm willing to let the fun of the experience slip away, nor do I believe that an organization of which I am not a participant of or a donor to owes me a certain experience.I don't like the changes often forced onto certain pieces of equipment, but if that is the only sacrifice required in order for them to continue to run, then I will endure.